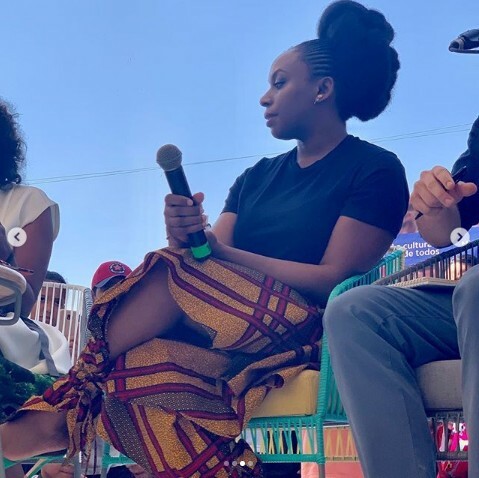 Chimamanda Ngozi Adichie wore a huge smile on her face when a Spanish fan told her that she named her daughter Chimamanda, after the writer. The Half of a Yellow Sun author is in Cartagena, Colombia, where she was invited to deliver the inaugural Gabriel Garcia Marquez lecture at the Hay festival. Following the lecture, Ms Adichie met with fans and it was a very emotional one for her, with a big fan, who could speak neither English nor Igbo, letting her know that she named her granddaughter after her. ‘I named my granddaughter Chimamanda,’ she said. Deeply moved by the warmth and love in Barrio Nelson Mandela. I have never wished so desperately that I spoke Spanish.